Ask about the combination Mash Tun Still configurations. The picture above is of 1 of our Standard Series 105 gallon Jacketed Bain Marie Stills with 6" Column and optional 1hp Agitator. 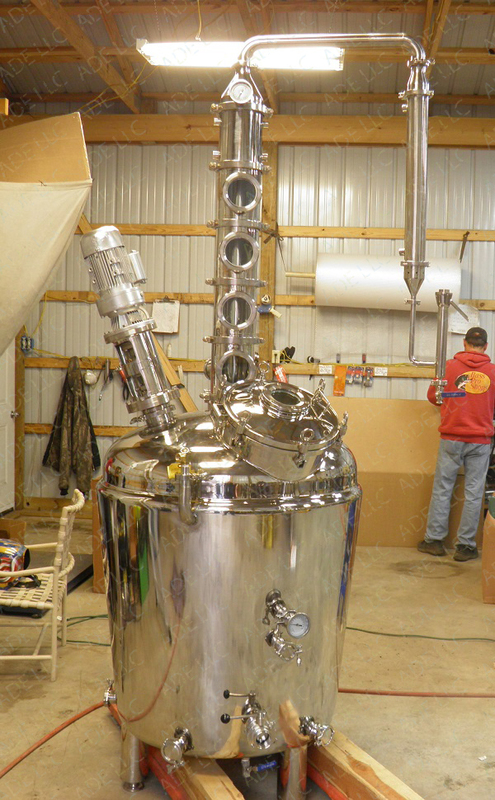 This 105 gallon still is great for Bourbon, Whiskey, Brandy, Grappa, Rum and many others. It will distill between 130 and 170 proof. 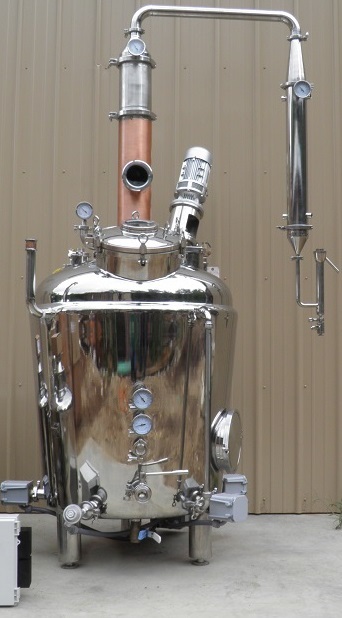 This Still has a beautiful 6" Diameter Stainless & Copper Bubble Plate Column with four 4" diameter sight glasses, Gatling Gun (Tube & Shell) Dephlagmator on top of the Column and a 4" Gatling Gun (Tube & Shell) Condenser on the side of the column. 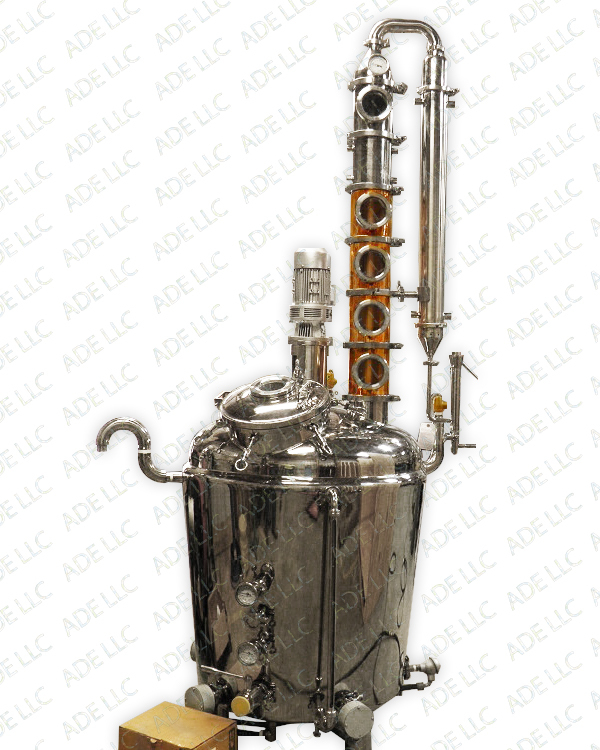 The column can be ran in Pot Still Mode to make Whiskey and Moonshine or it can be ran in reflux mode to make high proof light Whiskey or Rum. The boiler has four 2" Tri Clamp ports, with Tri Clamps and Cover Plates. The port can be used to install an electric element with controller (please see the heating system option listed below). Top quality construction with beautifully rounded curves. Polished to a mirror finish inside and out. Thermowell and Commercial grade thermometer with a 3" face. Variable speed WEG VFD drive for 1 hp agitator to be mounted on the wall NEMA1 enclosure. This VFDs enclosure is not rated for hazardous environments so it should go into a NEMA4x enclosure $389.25. This VFD can be wired 3 phase or single phase input, to supply power to the 3 phase agitator. 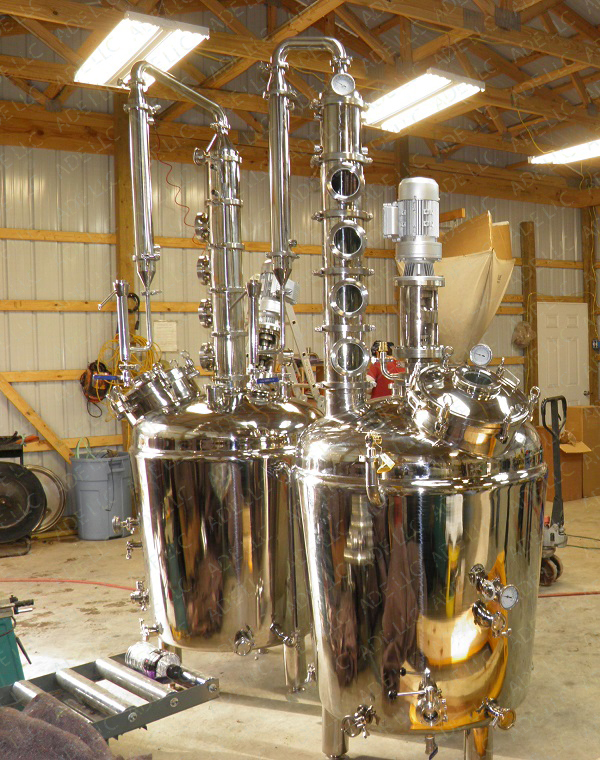 The still in the rear-left is a 105 gallon Standard Series Still.